This year’s composer mini-festival from Bernard Haitink and the Chamber Orchestra of Europe (COE) in Amsterdam’s Concertgebouw focused on Robert Schumann. In three concerts the Dutch maestro conducted Schumann’s four Symphonies and the Overture “Manfred”, as well as his Violin, Cello and Piano Concertos. 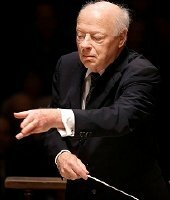 I attended two of the evenings, leaving quite convinced that some conductors are definitely like great wines – they get better with age – and Haitink (86), who recently received the Lifetime Achievement Award from the Gramophone Magazine, clearly wears that quality label. Distinguished soloists joined him for the concertos – on the evenings I saw, Gautier Capuçon for the Cello concerto and Murray Perahia for the Piano concerto. The harvest just doesn’t get any better than that. In the Indian Summer of his long career Haitink has been rethinking his readings of the great symphonic repertoire. When you listen to his Schumann Symphonies traversal with the Royal Concertgebouw from some three decades ago there is no doubt this composer has also received a significant revamp in Haitink’s mind. The orchestral forces are now much smaller of course, but this Schumann new-style sounds utterly vivid, light and colorful, skillfully balancing energy with melodic eloquence. And far from mellowing with age, Haitink’s Schumann has become edgier, riskier and often dramatically more intense. The period-performance movement evidently has left its mark and while the characteristic Haitink qualities are still in place – like this unerring sense of musical structure, the spot-on gravitas, and warm sonority – the overall blend is more compelling than ever. Schumann himself appears as more complex and less predictable, more human in fact. The often heard criticism of clumsy orchestration is once again proven unjustified. In the COE Haitink has found the ideal partner to bring these new insights to life. Orchestra and conductor worked together for years and it’s very obvious why Haitink called the ensemble “the greatest gift in the later stages of my career”. The evident chemistry between them was crystal-clear in these Amsterdam concerts by the responsiveness, alacrity and joy of the musicians. The maximum impact was achieved with the slightest of means. Haitink conducted everything with the score, always attentive to details and keeping everything under control with the smallest of motions. It was great to hear how the individuality of each of the symphonies was characterized sonically, but also by a keen understanding of their internal logic. 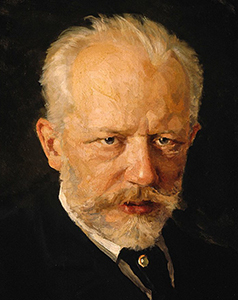 From the unbridled enthusiasm expressed in the First and also the Fourth Symphony (the latter performed in its 1851 reworking) with their transparent and limpid sound, to the struggling mood of the Second, brimming with excitement but also darkened by threatening intrusions. It made me regret I wasn’t able to hear them perform the “Rhenish”. The orchestral balance was impeccable, but also slightly different, quite logically, from piece to piece. The antiphonally placed strings were a constant joy (perhaps nowhere more so than in the multilayered canvas of the Larghetto of the First Symphony and the hard-driven Allegro molto vivace of the Second). The woodwinds, first oboe and first clarinet especially, were no less impressive. The horns were fine, too, but I felt somewhat underwhelmed by the remainder of the brass sections, not always that focused or powerful. Timpanist John Chimes was however ever-reliable and clearly had his moment of glory in the Second Symphony. Both the First and Fourth Symphonies were given superb readings, yet it was the Second which left the strongest impression. After a slightly hesitant introduction, Haitink unleashed the symphony with a passionate urgency virtually spanning the whole work in one single breath and leading towards an exhilarating, triumphant finale. Tempos were swifter than notated, the beautiful Adagio espressivo was fluent, but in effect this was one of the most convincing performances of a Schumann symphony I have heard recently: it had all the characteristics of the new manner, vivacious and transparent, but unlike most it retained its old-style grandeur and impact. The Haitink magic at its best. Both soloists in the concertos were entirely on the same track with Haitink. Schumann’s Cello concerto is not an easy work to tackle in concert, parts of it are densely string-scored, yet French cellist Gautier Capuçon made a very strong case for it. All tonal refinement and unforced eloquence, Capuçon was even more remarkable by blending naturally within the orchestra, yet at the same time leaving no doubt he was the prime voice. Starting as if in an improvisatory manner, he captured the contrasting moods of Schumann’s inspiration – now determined then delicate – with exquisite taste and sensitivity. Haitink also created a strong bond with pianist Murray Perahia throughout the years and seeing them together again at this stage of their careers was a moving experience indeed. Both musicians seem to feel each other instinctively and a more unified sense of purpose on a concert podium would be hard to find. Interestingly, Perahia (68) hasn’t softened with age either and the disarming naturalness of his earlier performances, including this concerto, has in places become more agitated and volatile, which frankly I don’t mind at all in Schumann. Especially when Perahia’s distinctive luminous, warm and silky tone and his crystalline articulation remain undiminished, and just as much in the fast passages as in the more meditative ones. The Piano concerto is one of Schumann’s most popular works but with artists of the caliber it continues to surprise. The final evening featuring the Piano concerto and the C Major Symphony, opened with a fiercely dramatic account of the Overture “Manfred” and was dedicated to the victims of the terrorist attacks in Paris two days earlier. Orchestra leader Lorenza Borrani appropriately asked for a moment of silence at the beginning of the concert, but it was just as much the message of hope and strength that Haitink and the COE revealed with Schumann’s music that sent us home in a positive mood. For Bernard Haitink this Schumann run was also a major personal triumph. The concerts were received with long standing ovations. He is Amsterdam’s local hero of course, but he deserves every bit of it. This was glorious music-making from a grand old master. Long may he continue. Categories: Concert reviews | Tags: 13 & 15 November 2015, Bernard Haitink, Chamber Orchestra of Europe, COE, Concertgebouw Amsterdam, Gautier Capuçon, Lifetime Achievement Award from the Gramophone Magazine, Marc Haegeman, Murray Perahia, Overture "Manfred", Robert Schumann, romantic symphonies | Permalink. Last May, following the example of many top orchestras, the Berlin Philharmonic launched its own record label, Berliner Philharmoniker Recordings. The twilight of the great recording labels has moved into another phase. The former flagship of Deutsche Grammophon and of EMI is going to market its discs itself. The inaugural release of Berliner Philharmoniker Recordings is a splendidly packaged Robert Schumann Symphonies cycle conducted by Simon Rattle, recorded during concerts throughout 2013. The Berliner wouldn’t be the Berliner if the presentation wasn’t extra special. 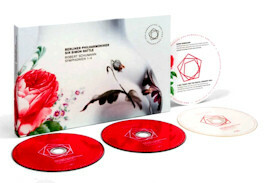 In the form of a landscape-sized linen-bound book with quality paper decorated with motifs from the posh Berlin porcelain factory, this Schumann box not only contains two CDs, but also a Blu-ray disc offering the concerts in Pure Audio 24-bit/96 kHz (2.0 LPCM Stereo or 5.0 DTS-HD MA) and in High Definition Video (Full HD 16:9/PCM Stereo or 5.0 Surround DTS-HD). Moreover included are a download code for high resolution audio files of the entire album (in 24 bit/up to 192 kHz) and a 7-day ticket for the Digital Concert Hall, Berlin Philharmonic’s video streaming service. This is sheer audiophile heaven. Categories: CD reviews | Tags: Berlin Philharmonic, Berliner Philharmoniker, Berliner Philharmoniker Recordings, Claudio Abbado, Herbert von Karajan, Marc Haegeman, Robert Schumann, Romantic, romantic symphonies, Simon Rattle | Permalink.